Notable features Rugged terrain, spectacular multiple moons. Prominent businesses Lumber, agriculture, mining, electronics. Homestead is remarkably Earth-like world, with a sun similar to Sol, and a day length and seasons and climate and gravity close to those of Earth. While an entire world with many different terrains, the inhabited areas tend to be in rugged and mountainous areas, the basins between mountain ranges, or coastlines near volcanic plate-edge ranges. They are drained by several large river systems, resulting in wide fertile valleys favored by farmers. Homestead is orbited by three moons. The outermost is larger than Luna (Earth's moon), and slightly closer; the other two are significantly smaller and locked into a 1:2 and 1:3 resonance with the largest moon. This, in combination with the influence of the sun, results in large complex tides. The fact that the moons' orbits are resonance-locked means that full conjunctions of all three moons are not uncommon, occurring once every 17.3 Homestead days. This conjunction is used to define the beginning and end of the local months. The smaller moons are brighter in color than Luna, so are more obvious in the sky. Homestead has been terraformed from a world nearly lacking in complex life. Areas far from Human settlement may still remain barren expanses where nothing grows, but these areas are getting rarer and more remote as the natural spread of weedy plants and insects results in Earth life taking hold. Around inhabited areas, you find temperate coniferous rain forests, pine woodlands, scrub steppe, chaparral, and open grassland. Work to establish tundra, taiga, deciduous hardwood forests, tropical rain forests, coral reefs, seagrass beds, kelp forests, and mangroves is ongoing. Earth microfauna and megafauna has been established, with an effort to produce functioning Pleistocene ecosystems. In areas not too far from Human settlements, you will find a number of large animals, typically those native to the north-west of North America. Pleistocene megafauna lost to extinction have either been replaced by surrogates (mustangs and burros in place of extinct American horses, Bactrians and guanacos and vicuñas in place of extinct North American camels, African lions in place of extinct American lions, African cheetahs in place of extinct American cheetahs), or cloned from recovered DNA from frozen Siberian carcases and remains from La Brea (Columbian and woolly mammoths, dire wolves, teratorns, ground sloths, and sabercats). Ocean life and river salmon runs have grown enough that they support several lucrative fisheries. The Numa river is one of the great rivers of the planet of Homestead, and drains most of the area settled by humans. It cuts through the vast mountain ranges in mighty gorges and spectacular canyons, widening out into fertile floodplains in its lower reaches. The upper Numa is separated from the lower by a series of cascades and waterfalls; in its upper reaches it is a lively river coursing down the northern Rampart Mountains over beds of rapids. The lower Numa flows through the Howlaák Valley between the Ramparts and Sawback Mountains, forming a rich floodplain favored by the Steaders for agriculture. It finally cuts its way through the Sawbacks in a vast gorge, whose towering bluffs give rise to many a waterfall tumbling in silver streams to add their water to the mighty Numa. The Numa is fed by many tributaries, several of which are significant rivers in and of themselves. The largest of these is the Lutsali River. While the Numa flows south from its birth in the northern Ramparts, the Lutsali flows north before meeting the Numa just before it enters its great gorge though the Sawbacks to the ocean. The Lutsali is longer than the Numa, but because the southern lands get less rainfall, it carries less overall flow. The lower Numa is navigable, allowing barge traffic to transport goods up and down the river. Many settlements along the river have grown into cities, thriving on trade. Plying the river can be an adventure – the Numa has never been tamed by dams or locks, and shifting channels and sandbars, hidden rocks, and high or low water can all spell disaster. Experienced navigators are in demand. Passenger boats along the Numa can be quite an experience, replete with shady and interesting characters, gambling halls, luxurious accommodations and dining for the wealthy, and business transactions and the occasional fistfight breaking out on board. The Numa and its tributaries now support large salmon runs, providing an important source of food and income to the people. The yearly return of the salmon is celebrated with a salmon festival featuring dancing, singing, plays, fairs, exhibitions, contests, and, of course, feasting. The Sawbacks are tall, rugged mountains, difficult to traverse, with rushing streams, tumbling waterfalls, and tall forests on their lower reaches, leading to permanent snowpack and glaciers at higher elevations. The range runs along the coast, punctuated by volcanoes, for the length of the continent in which Homestead colony occupies, and the far reaches are still unconquered by Earthlife. The slopes facing the ocean catch frequent rains, mists, and drizzles, and are often swaddled by clouds. This feeds temperate rainforests, thick with towering Douglas fir, western hemlock, western red cedar, redwoods, and giant sequoia, and bedecked with ferns and moss. The inland slopes are drier, hosting open woodland of ponderosa pines, scrub, oak savannas, and chaparral. The range casts a rain shadow across the Howlaák Valley, resulting in semi-arid conditions for some distance inland. The Sawbacks are sparsely settled at best, with most of their extent being trackless wilderness. The inland foothills host farms, wineries, vineyards, orchards, and extensive lumber plantations, but as you go higher the population rapidly dwindles. Some hardy settlers scratch out a living here, but the mountains have acquired a reputation for hosting dangerous and desperate men, bandits and outlaws on the run from the law. Some say that scattered nests of squirm can still be found deep in the mountains that escaped from the Republican Army's assault. Brave explorers who manage to avoid and overcome these dangers still must deal with grizzly bears, landslides, harsh weather, rattlers, heat stroke, cougars, hypothermia, lions, freak snow flurries, sabercats, poison oak, flash floods, wolves, sudden downpours, dire wolves, towering precipices, rockfalls, stampeding mammoths, and other hazards of the back country. One of the largest individual mountains in the Sawbacks is Mount Ramone, a towering snow-capped strato-volcano overlooking the Numa gorge from the north. Mount Ramone is considered a sacred site by many of the practitioners of traditional Native American spiritualism, a place to connect with the divine. The Ramparts are the highest mountains on Homestead, folded from continental crust due to the collision of two massive tectonic plates and sculpted by glaciers into dramatic peaks and valleys. It is forested by Douglas firs, western hemlock, lodgepole pine, firs, and spruce in its northern and colder reaches with quaking aspens in wetter ground, transitioning to ponderosa pine, juniper, oaks, and pinyon pines in warmer and drier zones. Whitebark pines grow near the treeline. The Ramparts have only light settlement in their foothills, and nearly no permanent human or other sapient presence higher up. They have a reputation for being haunted by bad spirits. Recently a mountain man came stumbling out of the mountains into a small settlement at their base, babbling incoherently. Records indicated that he had set out the previous season in a group of prospectors, looking for silver and copper. The fate of the rest of the group is unknown. This would not be all that remarkable, save that in his hands he clutched what was unmistakably an Antecessor artefact. This has generated tremendous interest, and it is likely that soon swarms of people will be trekking into these mountains, looking for Antecessor treasure. Between the Ramparts and the Sawbacks lies the Howlaák Valley, which is the most densely settled region of Homestead. The broad river floodplains and rolling hills of wind blown volcanic dust and ash have proven fertile ground in which to grow a variety of crops. The northern reaches of the valley grows wheat, barely, rye, oats, corn, potatoes, onions, grapes, cherries, and apples; while almonds, peaches, walnuts, pistachios, olives, apricots, dates, figs, kiwis, plums, strawberries, citrus, lettuce, tomatoes, cole crops, carrots, asparagus, celary, garlic, peppers, cotton, and rice become more common as you go south. Both the offworld wormhole station at New Clarkston and the planetary capital at Wawawai are located in the valley. Where the land is not farmed, typical vegetation includes bunch grasses and sagebrush. Inland of the Ramparts is a vast plateau of flood basalts called The Traps. Nearly unsettled, Earth-derived scrub-steppe vegetation has taken hold here, along with the occasional jackrabbit, coyote, pronghorn, and mule deer. Water-carved channels through the rock lead to spectacular scenery in places, with hoodoos, standing stones, monoliths, and dry falls lending vertical relief to the land. Other areas are flat and featureless, unbroken to the horizon. The Traps are an arid land, although large rivers carrying runoff from the west Ramparts flow through on their way to the western ocean. They are rarely visited, save by the odd wandering ecologist. 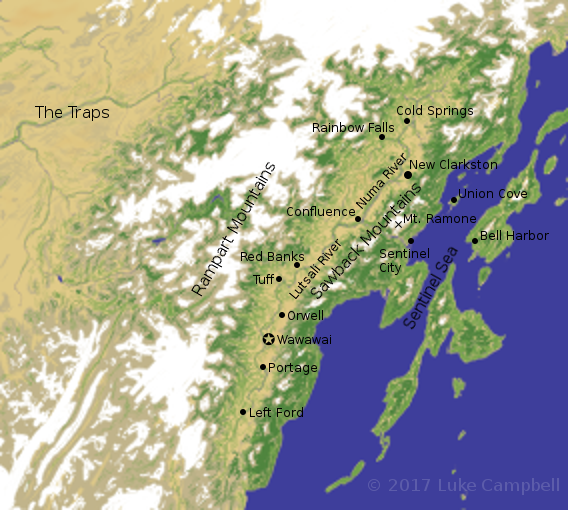 An inland sea, bordered by the continental coast to the west and island arcs and small land masses to the east. It offers rich fisheries, with aquatic Earth-life flourishing in its fertile waters. The Numa river empties into the Sentinel Sea, and small fishing settlements are common along the coast and on some of the islands. The coast along the Sentinel Sea is known for its near-ubiquitous precipitation, as the Sawbacks catch the humid air flowing inland forcing the moisture to condense. The sea takes its name from a group of sea stacks, called the Sentinels, at the mouth of the Numa river. Recently, humpback whales were cloned, grown, and introduced, and now two pods of these great cetaceans roam the waters. This has been counted as a singular success in the great Homestead terraforming project, and was met with planet-wide celebrations. Next on the agenda is the introduction of grey whales. Homestead was identified by telescope from Jefferson as a likely candidate for a habitable planet. When the first wormhole arrived from Žemyna, it was discovered to be a remarkably Earth-like planet. Its biosphere was very primitive – mostly bacterial slime, with some primitive worms and gelatenous filter feeders. Despite this, it had a breathable concentration of oxygen in its air from mineral-rich upwellings in the oceans fertilizing vast algae blooms. This initial exploration happened at the time of the Great Burning of the Inland Northwest. Severe droughts and devastating wildfires had destroyed Wenachee and Lewiston, and damaging or threatening many other towns and cities in eastern Washington state and the Idaho panhandle. Crops and orchards around the region were consumed by fire. The Snake and Columbia river were filled with silt from runoff of newly-denuded slopes, suffocating the great salmon runs of these rivers and clogging the reservoirs of the dams used for irrigation and flood control. The air was filled with choking smoke and soot. It was the displaced people from this region that were the primary initial settlers of Homestead. In addition to Americans of primarily European and Hispanic descent, a significant fraction of these early colonizers were from the Columbia Plateau tribes. The Nez Perce Nation lost nearly all of their reservation, and the Yakama, Coleville, and Umatilla reservations were also severely burned. While many of the displaced stayed behind to rebuild, a significant fraction emigrated to Homestead. 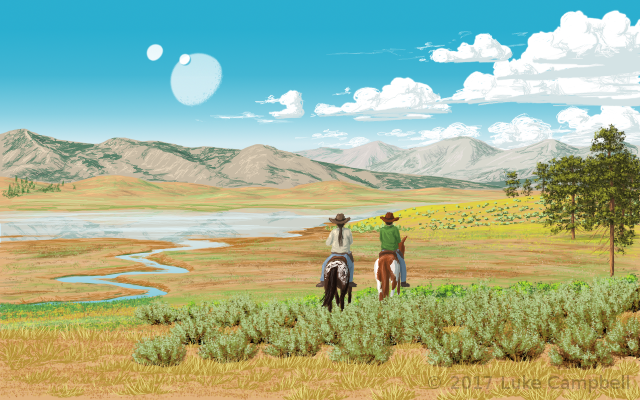 As the droughts worsened and the inland northwest became a desert, more of its inhabitants decided to pack up and move out and Homestead was a popular destination. Since Homestead lacked complex land life, it had no soil – just sand, dust, and ash that was not bound together and enriched with organic matter. To overcome this deficiency, the colonists settled in the valleys within and between towering mountains, and rolling dune fields of wind-blown dust and volcanic ash from these mountains. The weathered sediments, deposited by wind and river, contained vital nutrients for plants to grow. It helped that the rugged landscape reminded the settlers of their home in the Cascade and Bitterroot mountains, and the rolling plains of the Palouse. The settlers of Homestead resolved to re-create their lost home as best they could on this new world. 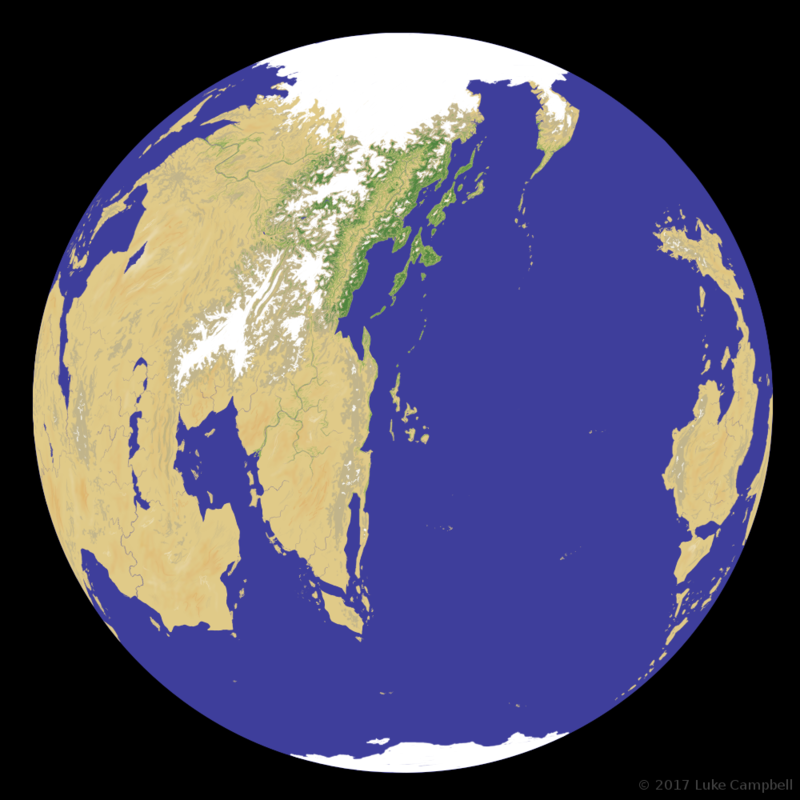 Climate simulations showed that some areas, when terraformed, would be suitable for Northwest ecosystems. Pioneering plants were initially released to build soil, followed by more advanced species to create a complex web of life. Within 200 megaseconds (6 years), forests of sapling Douglas fir and ponderosa pine were beginning to grow in many areas. Within 500 megaseconds (15 years), salmon were swimming in streams and deer were browsing in the forests. Once started, life found a way and quickly spread. Within a couple gigaseconds (60 years), functioning Earth ecosystems had begun the process of becoming fully established. During the Chinese occupation of the Verge, the Steaders put up a vigorous fight. They were initially defeated in open warfare on the battlefield, but took to the mountains to wage guerilla war on the invaders. The Chinese took control of the more populated towns, but never had enough manpower or resources to hunt down the partisans in their mountainous hideouts. The Steader partisans were a thorn in the side of the Chinese governor for the duration of their occupation, until the Verge was re-claimed by the United States 600 megaseconds (20 years) later. Homestead was occupied by the Zox for 50 megaseconds during the initial contact of Humans and Mants, in what came to be called the Homestead-Zox war. The people of Homestead put up a spirited resistance, striking at the Mants from their wilderness bases. It is widely believed that the bravery and cunning of these Homestead freedom fighters is what stopped the Zox in their tracks, keeping them from reaching Žemyna and further worlds downstream along the American bough. When a raid of Steaders into Zox-occupied New Clarkston broke through to the wormhole terminus, they were able to deploy a jury rigged device made with captured Mant technology to break the gate-clamp and allow American forces to come through from Žemyna. This turned the tide in favor of the Humans, and drove the Mants off Homestead and then out of previously occupied Human worlds. The Homestead-Zox war brought home how dependent the colonists were on off-world resources. They resolved to become more self-sufficient, establishing a local technological base. Indigenous production of equipment and vehicles from local fabs, tailored to the needs of those on the frontier, came to compete with imports from Earth (although due to greater cost and lower sophistication, they remained largely a niche industry). War veteran Jack Sòng, who had cobbled together a shoestring weapons manufacturing operation during the war, started the Verge's first corporation dedicated to industrial production – Sòng Electronics – which became the most successful of these startups. This fledgling manufacturing ability was vital to the later survival of the Verge, during the Bump in the Night. In the time since the Bump in the Night, the Homestead colonies have grown. But Homestead is a big world, and it will take considerably more growing to do before it is filled up. An on-planet wormhole has been set up to connect New Clarkston to Wawawai. There is talk about adding several more lines to open up the back country to development. Homestead has been subject to two attempted Squirm invasions. The first was detected early and quickly eradicated; the second caused considerable loss of life in the Blackrock valley and surrounding communities before the Republican Army smashed the infestation. The Homestead government has the fairly typical structure of a popularly elected governor as the chief executive, a bicamaral legislature elected by popular vote among the districts they serve, and a court system with elected judges. Powerful interests are the wealthy lumber, mining, and farming industries, with large mechanized farming corporations often coming into conflict with smaller independent farmers. In remote areas, some territories are run nearly as fiefdoms of a wealthy business owner. This often leads to people going outlaw as they fight the injustices perpetrated in the only way they can. Although they have no official status, the Tribes have considerable clout as traditional representatives of a large fraction of the people. The Tribes are headed by tribal councils with a chief elected by the tribe members. The largest tribes are the Nez Perce, Yakama, and Spokane, but many smaller tribes exist and often cooperate in intra-tribal councils to coordinate their activities. Officially Homesteaders, although they are near-universally called (and call themselves) Steaders. More colloquially, the term "Steadies" is also common. Homestead is primarily settled by Humans, comprising some 94% of the population. Much of the remainder is composed of Pannovas, with Laer and the occasional questing Gummi or hive of Mant refugees rounding out the rest. The ideal Homesteader talks straight, shoots straight, rides well, keeps his or her word, knows how to survive in the wild, is capable of supporting his or her family, helps out his neighbors, and stands by his friends in times of need. Steaders value self-reliance, rugged individualism, and independence; but at the same time come together in their local communities to support one another. There is a strong streak of egalitarianism within their society, with manual laborers being respected for what they do as much as the wealthiest ranchers and owners of rich mines. Attempts to appear superior to others are discouraged, and being served (other than in a temporary capacity by paid waitstaff) makes them feel uncomfortable. Steaders typically have a friendly if somewhat reserved attitude, and treat others with respect by default unless it is demonstrated that the person is not worthy of such consideration. Steaders value outdoors experience, with myths of stockmen, rangers, mountain men, prospectors, outlaws, and lawmen operating far from society's influence shaping their identity. The combination of Western environmentalism, Native American reverence for nature, and a longing for their lost home has led to near universal support for the further terraforming of Homestead, and a strong sense of value for wild places and wild life. Horses have a special place in Steader culture. Their utility at working cattle and sheep, getting into the back country, and hauling cut timber with minimal disturbance to the surrounding forest makes them prized animals. Steaders favor rugged working breeds, such as quarter horses, appaloosas, paints, and draft horses, often mixed with mustang stock. Norhorses are popular where more independence and initiative is called for, or when it is necessary that the steed better communicate with its rider. Most rural Steaders have at least horse or three, often more. Typical Steader architecture is a single family ranch house, often with several out-buildings such as sheds, garages, and barns. In the cities, houses are smaller and closer together, and many people live in apartments. While the Tribes may celebrate their heritage with the occasional pit house, tule-mat lodge, tipi, or bark hut, these are not structures commonly used for living (with the exception of the occasional camping trip). Steaders eat a diet of simple, hearty fare. Steak and chicken are common meats, potatoes, wheat, and barley are typical sources of starch, with carrots, onions, cole crops, or other vegetables served alongside. Orchard fruit, when in season, is readily eaten raw or in pies and cobblers. Wild game is a common item in the diet, from elk or deer venison to duck or goose. Salmon is a particularly cherished addition to the diet - it had a strong impact on the cultures of the inland northwest from which the Steaders derived, and now that salmon grace the rivers and streams of Homestead in their multitudinous abandon they are commonly harvested and consumed fresh or smoked and stored for later in the year when the runs are over. Wild plants and mushrooms are commonly harvested and eaten, from berries to starchy roots such as arrowleaf balsamroot, camas lilies, Lomatium, Perideridia, and pine nuts. The primary language spoken in Homestead is English, with significant groups of Spanish and Mandarin speakers. In addition, during the Earth Heritage Revival movement, many people looked back to their ancestors to revive the nearly-extinct languages of Sahaptin and Salish (and their various dialects and closely related languages). Today, many people grow up speaking Sahaptin or Salish around the home, although nearly everyone learns to speak English for dealing with people outside of the family or like-speaking community. Most Steaders are Christian, although Buddhism and Taoism have significant followings. Many people combine Christianity with tribal spiritual beliefs, however. This world view sees world as alive with spirits, which can affect a person's fortunes and control the forces of nature. Some people are able to contact and communicate with these spirits. These people can become respected and powerful shamans, or feared sorcerers or witches. In the tribal traditions, prayer often takes the form of singing and dancing, which people use to contact spirits, induce visions, perform shamanic rituals, or during various cultural holidays such as the winter ceremonies or the return of the salmon. People can cleanse and purify themselves by steaming in a sacred sweat lodge. Young men or women entering adulthood often go on vision quests to connect with a powerful spirit (called a wayakin by Sahaptin speakers), which are believed to protect and guide the supplicant and give him special spiritual powers. 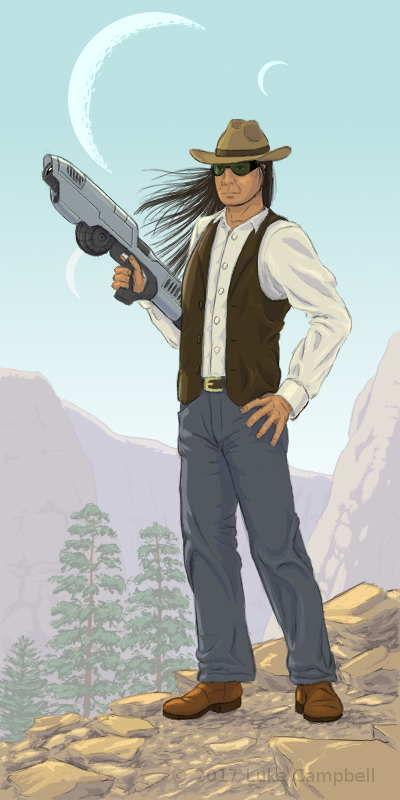 A vision quest involves many hundreds of kiloseconds (weeks) of preparation, involving purification and meditation. At the time of the quest, the supplicant goes into the wilderness alone, fasting and praying until he receives a vision or other sign of his guardian spirit. Among the Sahaptin speaking tribal cultures, many follow a religious or spiritual tradition called Washat, also known as "the Dreamers" or the Seven Drums religion. Washat preaches respect for the natural world and rejects violence. Its practitioners meet for weekly feasts with singing and dancing to the music of drums and bells in traditional longhouses. The Miles Family: Sam Miles never had much, but what he had burned with the rest of Lapwai, Idaho. He took his insurance money, bought some horses, cattle, hay, grass and alfalfa seed, and a ticket to Homestead. Finding a likely plot of land, he planted his seed and fed the hay to the horses and cattle while the grass grew, then used his pastures for his livestock. His herds did well, and grew. Soon, Sam Miles was a successful rancher and became one of the wealthiest men on Homestead. His fortune secure, Sam set about finding a wife and started his dynasty. The Miles family he founded is the closest thing Homestead has to aristocracy. They are wealthy, influential, and have a long and proud history. Jannie Miles led a group of partisans during the Chinese occupation after the Chinese executed her husband. During the Homestead-Zox war, Joe Miles led the resistance and Joe's daughter Emily Miles (later Emily Sòng) was famed for her marksmanship and daring raids on the enemy. Many of Homestead's governors, senators, and representatives were Miles, and Jane Miles even made an unsuccessful run for the Republic presidency. Many political observers place even odds that she will run again. Homestead's wormhole terminus is in the city of New Clarkston, and is thus the city most often seen by off-worlders. It is a thriving city growing along the Numa River, deep in a canyon through the Sawback Mountains, protected from floods by a series of levees. New Clarkston is home to the headquarters of Sòng Electronics and many of its factories, supplying the Verge with a multitude of electronic goods. Wawawai, or "Council Grounds" in the Sahaptin dialect of the Nez Perce, is the seat of government of Homestead. A relatively lively if small city, it sees a fair amount of traffic as people do government business. It is located by the banks of the Lutsali river. The outskirts of Wawawai are home to the campus of Homestead University of Agriculture and Mining. With a main campus a short distance outside of Wawawai, and closely associated with the local university, the Heritage Genebank maintains the most extensive and complete collection of genetic samples and sequences of Earth life in the Verge. It also develops and maintains methods for cloning and growing Earth-life to the point where they can exist independently. By necessity, the Heritage Genebank has a large zoological garden, and this zoo is a popular attraction and afternoon diversion. After the Bump in the Night, the Heritage Genebank has begun to collect samples and gene records of life from other worlds in the Verge, and develop methods of propagating them. All gene sequences are publicly available on the Heritage Genebank web site, with the exception of dangerous pathogens such as smallpox.